People come to us for donations of all kinds: for old-age homes, eye donation camps, healthcare needs, AIDS afflicted. We could have kept writing cheques, which we did for a long time and still do. But after the earthquake in Gujarat (Bhuj, 2001), some people came to us seeking help, and I still remember thinking that even this cheque will go into a large, black hole. It made no sense. I knew we needed to do something that would create an impact. My mind was working at building a core around our giving activities. When I discussed this with Rakesh (elder brother) and others, we wondered what kind of activity would have a multiplier effect. And I knew it would be education, especially in villages where schools are not available for the poorest of the poor. I firmly believe that if you teach a child, chances are that eventually this benefits the whole family. Another factor also set me thinking. We had given crores to the Indian Institute of Technology (IIT), New Delhi, and while it (Bharti School of Telecommunication Technology and Management) was and is a great project, I felt that the output was very poor—in the sense that the number of students who qualified on that money was no more than 100 a year. In effect, we were spending very large amounts of money on high-quality education but it benefited few. I like scale; everything we do is done on a large scale. I felt that the money that had gone to IIT would have worked much longer had we done primary education. This is where our shift in focus came, and we decided the Bharti Foundation would set up a programme that would build and run 500 primary schools across the country. We consulted a lot of people like Arun Kapoor, director of Vasant Valley School in New Delhi, and many other educationists, saw the government school models and then finally developed our model. The model had to be fine-tuned and that’s where the expertise of people like Manju Bharat Ram, who is on our board, came in handy. For example, initially we wanted to have two classes going on at the same time in one classroom. She objected to that. Finally, we came around to her point of view. Another key idea was to hire teachers from within the local ecosystems, so that they don’t leave easily. We also felt regular teachers’ training is very important. Even today, despite our efforts to hire good staff, there are teachers who are not up to scratch. Therefore, we have to train them constantly. We did not realize when we started out that we would end up training them for 20/25 days in a year but it helps and so we have continued the process. Teachers also like it because they get to learn about new tools, methods, and get acclimatized to our way of education. Homeward-bound in a tractor-trolley (jugaad). While we were developing the model, we wrote to many members of Parliament cutting across party lines asking if they would be interested in this programme. We had asked them only to connect us to village panchayats and work with us at convincing them to lease land for the school buildings. Some responded but most did not. Now the Satya Bharti School programme works like an organization; each school follows the standard operating model. You go to one school and then the other and everything will be exactly the same. The curriculum, of course, had to be the same anyway and so we developed our own curriculum and it is dramatically different from the government schools, and much better. I am a firm believer in the fact that practical modules should be added to theory and this is the right way to impart education. Our teachers are trained to teach more through visual effects, through props and that’s how it is in the rest of the world. I have always opposed the rote method and we will not go that way. We want our children to absorb the ideas. I feel that’s why our students do better. We have seen the results after the schools have been operational for five years now and they are positive. There is a beautiful story which was narrated to me about a child from one of our schools who taught her parents to sign. When they came in for a parent-teacher meeting, the teacher pushed forward an ink pad for the thumb print but they asked for a pen instead and signed on the report card. This is the positive aspect of what we are doing. Having 33,000 children in this programme currently is quite impactful even for a country like India and every year the outcome only delights us. Rakesh, whenever he goes into those villages, says he is showered with love. Will this have any spin-off or benefit for our business, I don’t know. But the goodwill for the family, for brand Bharti, for the foundation is enormous. I know, we said that we would only do primary schools initially but within a year or so of the schools being operational we realized this is not a good thing. We were giving a reasonably good quality of education to the students and then leaving the child in a lurch after class V. When he comes out of the Satya Bharti School Program he does not want to go to a government school. That’s why we decided that in the first phase we will cut down the primary schools from 500 to 250 and use the remaining funds to build 50 secondary schools instead. Companies like Google are partnering with us to build elementary schools (up to class VIII) in some areas too. Right now, we are in a consolidation phase. We have 233 primary schools, 12 elementary schools and five senior secondary school running in Punjab, Haryana, West Bengal, Rajasthan, Tamil Nadu, Uttar Pradesh and some are in public-private partnership with the government too, so we have taken a step back to figure out if all is well; why is the attrition rate of teachers high; why do students drop out. There are still some students who are not doing well, their grades are not picking up. Absenteeism in schools bothers me and the sheer fact that children are coming from 2-3km away is upsetting. Our idea was to enrol children from nearby areas only but that is not happening. We get children from even 2-3km away. 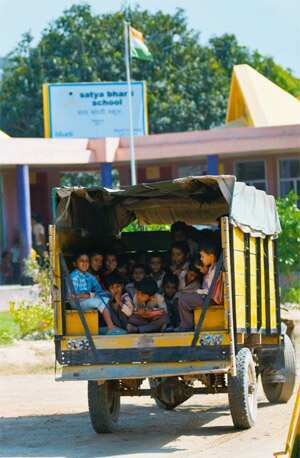 Sometimes parents use tractor-trolley (jugaad) to bring children to school. That is a challenge. There is discussion now, “Should we run buses? ", but I don’t think we can now be a transport company too. There is time when you need to stop, breathe and take corrective actions and then go ahead. That’s what we are doing now. Later we will look at states like Bihar and Orissa to open more schools. Another thing we are looking at is to take promising students beyond the primary and secondary system. I want doctors, pilots, lawyers to come out of this scheme; that will be the high point. We will run scholarships for these children. If need be, I will move all scholarships from those engineering colleges and bring them here. I am happy when state governments want to partner with us. But what takes a long time usually in these partnerships is that we are clear that we don’t want daily interference. We have said no to money because we will not compromise our style of functioning. That has been quite a struggle because when any government puts in money or the education department puts in capital, they want more control. We are happy to be subjected to massive amounts of transparency. If they want weekly reports, we will do it, if they want to audit us, we are happy, but we can’t run the schools the way they want to run them. We have had a breakthrough in Punjab recently and now six Government Satya Bharti Adarsh Senior Secondary schools run in partnership with the government. Can this be done on a much grander scale by us? It can be done. We have funded the project heavily, have put the right people behind it and have passionately pushed the project. But my real hope is that 100 organizations will look at this model and says yes this works and then push for it too. I would be happy to just open up the elements of this programme for them, let them send in their people to see the model and then transport it and make it work. At the end of the day, if 100 companies dedicate themselves to this, there will be a dramatic change.